When Michal Vadai's experiment worked for the first time, she jumped out of her seat. "I cannot stress how exciting it was to make it work the first time. It was a huge technological challenge," said Vadai, who is in the lab of Jennifer Dionne, associate professor of materials science and engineering. "The first time we got the beginning of an experimental result, we were shouting out loud. It was very, very exciting that we could see and control what was happening to this nanoparticle with light." 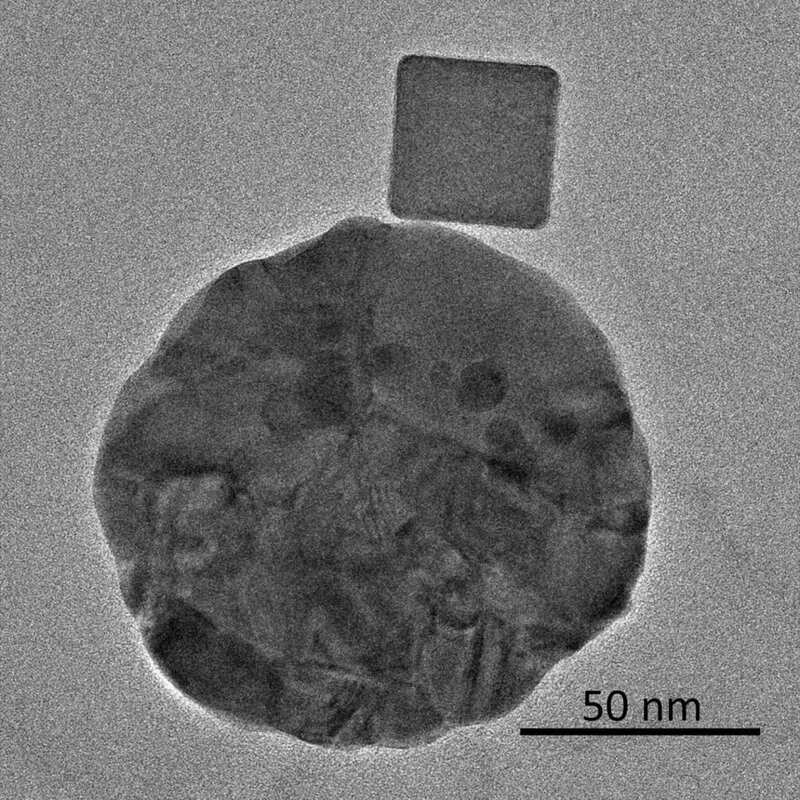 This research, published Nov. 7 in Nature Communications, focuses on a photocatalytic reaction where energy from visible light initiates a chemical reaction in nanocubes of palladium. Each of these cubes is about 30 nanometers on each side – roughly the size of a cold virus. Transmission electron microscopy forms an image by beaming electrons through a thin slice of material. This process reveals structures in intricate detail but it doesn't allow scientists to observe materials as they change under different light conditions, like light receptors in the eye, materials used in solar cells or, as in this case, palladium nanocubes for catalysis. The new setup melds the resolution of electron microscopy with the color of light microscopy. To test the setup, the researchers pumped the specimen's chamber with hydrogen. Looking through the electron microscope, they could confirm the palladium nanocube changed its phase as it filled up with hydrogen. The experiment was structured so that the nanocubes would remain in this hydrogen-filled phase until the researchers turned on the light. Once illuminated, they watched as a water-like wave flowed gracefully across the particle – the hydrogen leaving the palladium. It was a light-based reaction seen by an electron microscope and a jump-for-joy-worthy success. Nanoparticles are often produced and studied in large numbers, which means we know they vary in size, shape or position – but we know little about how those variations affect performance. The initial experiments were largely designed to show that the technique could work, but still revealed something new about the nanocubes. For one, the reaction happens 10 times faster in the light than in the dark. The researchers could also see how each step of the reaction – the hydrogen leaving the nanocube, the lattice structure of the nanocube rearranging – is affected by different wavelengths of light. It also turns out that the corner of the nanocube closest to the light absorbing region – in this case, a nearby gold disk – is most reactive. Understanding how and why that happened could potentially allow for product-selective reactions based on the catalyst geometry. Co-authors of the paper are Daniel K. Angell, Fariah Hayee and Katherine Sytwu of Stanford. Dionne is also a member of Stanford Bio-X, an affiliate of the Precourt Institute for Energy and a member of the Wu Tsai Neurosciences Institute at Stanford. This research was funded by Chi-Chang Kao at SLAC National Accelerator Laboratory, a postdoctoral fellowship from the TomKat Center for Sustainable Energy at Stanford University, the Gabilan Stanford Graduate Fellowship and the National Science Foundation.